The English School was founded in 1900 by Canon Frank Darvall Newham, a young man of 36 who had just arrived on the island, which was to become his home for the rest of his life, as an Instructor of English to government clerks. 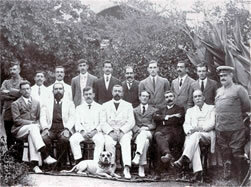 He subsequently became Director of Education under the colonial administration but was also Headmaster of the English School until his retirement in 1936. The School began with 13 pupils but rapidly grew to become the premier English medium school in Cyprus, drawing its students from a range of cultural communities both locally and abroad. The School changed its status in 1936 when Canon Newham gave it in trust to the colonial Governor, however the School continued to be an English-medium, inter-communal school of Christian character with facilities for all pupils to practise their own form of religion as defined in the English School Management and Control Law of 1935 and its amendments. 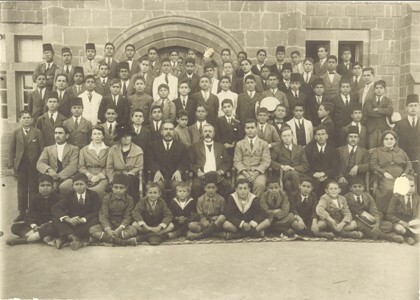 The School was based at various locations around Nicosia, including what is now the District Courts, until 1938 when it moved into the present purpose-built accommodation in Strovolos on grounds purchased personally by the Canon. The Lloyds Building and the Alks Building were constructed as boarding houses in 1940 and 1947 respectively. During World War II the School was evacuated to the Dome Hotel in Kyrenia for a short period of time, but was safely settled back into its home by the time of Canon Newham's death in 1946. The English School for Girls (founded in 1957) was incorporated in 1962 and The English School became the first co-educational school in Cyprus. In 1960 Cyprus gained its independence and a special law was enacted which passed control of The English School to the Republic of Cyprus, which oversees the operations of the School through a Board of Management appointed by the Council of Ministers. The Board of Management comprises nine members and a Chairman who are appointed by the Council of Ministers, and the Director of the British Council as an ex officio member. The current Chairperson is Dr. George Theocharides. The School served all the communities of Cyprus, with several Boarding Houses which allowed pupils from all over the island to attend. The School roll peaked at over 1,000 shortly before the events of 1974. The tragic events of 1974 changed the School in many ways. Turkish Cypriot pupils and teachers were forced to withdraw. An influx of refugees from the occupied areas coming into the free area of Cyprus led to the Alks Boarding House being loaned to the Government, initially for one year, to set up a refugee school. The building continues to this day to house the Acropolis Gymnasium. In the 1980s boarding in Lloyds came to an end and the building was converted to Year 1 and 2 classrooms. By this time the bulk of the student body came to be composed of Greek Cypriots. Nevertheless, the School retained its commitment to the education of all the communities of Cyprus. In 2003 the English School readmitted Turkish Cypriot students for the first time in 29 years and their numbers have grown steadily since then. The current student population of the school is 1043 and there are 106 teachers and 20 support staff. The academic programme lies at the core of the School's activities and is based on the model of British independent secondary schools. For the first three years all students follow a broad curriculum designed to lay foundations for public examinations and to give them a taste of all the subjects on offer. At the end of Year 3 students choose their programme of International General Certificate of Secondary Education (IGCSE) subjects with a compulsory core of English Language and Literature, Mathematics and Modern Greek. From Year 6 students construct an individual academic programme with five Advanced Supplementary (AS) level courses being followed during this year. In Year 7 the students choose to continue with four of their subjects to Advanced Level (AL), with the supporting programme continuing. One of the School's unique strengths is its vast range of extracurricular activities and clubs which students are encouraged to join. These continue the Canon's vision of broadening a student's overall education and developing team-spirit and self-confidence. The School has over 40 clubs and societies. The range of clubs and societies to choose from includes Maths, Economics, Literature and Drama, Languages, The Duke of Edinburgh's International Award, Under the Same Sky, Chess, Music, First Aid, Talent Nights, Voluntary and Charity Work, Sports and Athletics, and numerous others. Many of these involve representing the School abroad at various international events with excellent results. An example is our School's Debating and Public Speaking Society which always attains one of the top places in overseas competitions. The English School has twice hosted the World International Public Speaking and Debating Competition in which over 60 students from schools from all over the world compete. Our Greek Play has twice won First Prize in the Pancyprian Competition for Secondary Schools and has competed in the Panhellenic Competitions held in Greece with other finalist schools. The Comenius I Language Project has brought together our students and staff with those of the Radnotti School in Hungary with all reaping the benefits of a better understanding and appreciation of each other's culture and heritage. Our students also have the opportunity to be selected to attend the London International Youth Science Forum in the U.K. and the Global Young Leaders' Conference in the U.S.A.
Sports have always been highly emphasized at the English School since its founding in 1900 in order to develop team ethic as well as a competitive spirit in the student population. There is a House system which organizes both competitive and non-competitive sporting activities. The more able are encouraged to play in House and School competitions in football, basketball, volleyball, hockey, softball, athletics and cross country; less able pupils participate in the same sports for enjoyment and fitness. All the major sports are coached by an experienced team of Physical Education teachers. This has led to excellent achievements in Pancyprian sporting competitions as well as the Dubai Football Tournament, to name but two. The Choir and Orchestra have both been active and highly successful aspects of School life since they were first established by Canon Newham in 1911. Students are encouraged to take up instruments by the School which provides tuition by experienced music teachers, free of charge for certain pupils who reveal special aptitudes. These are but a few examples of the spectrum of extra-curricular activities available. The Library Resource Centre encourages students to use its facilities for both reference, fiction and studying. Computers are provided for students' use in addition to the books, magazines and multimedia. Securing a University place at a highly competitive University is the ultimate ambition of our students and acceptance at a top University requires much more than just A Level grades. The School's Career & University Entry Department ensures that our students have access to sound advice and support throughout their academic career. 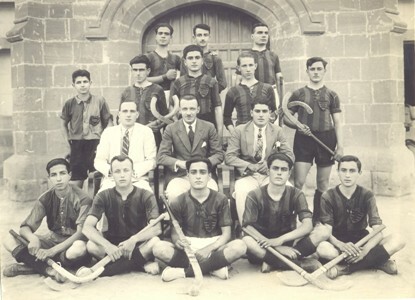 In addition to the traditional stone-built 'Main Building' which was constructed in 1938, a Sports Centre was added in 1990. The Science Building, which was funded by the Government and houses the Science and Information and Communication Technology (ICT) Laboratories, Library Resource Centre and a Lecture Theatre, was inaugurated by H.E. the President of the Republic Mr. Tassos Papadopoulos and the Chairman of the Board Dr. Andreas Panayiotou in November 2004. The Board of Management strives to provide up-to-date facilities and equipment to assist students to reach their maximum potential. There are plans for further improvements in the infrastructure of the School which include the replacing of the old 'Newham Building' with new premises which will again be funded by the Government. The English School is fortunate in having a very active and supportive Parents' Association (ESPA) and Graduates' Association (ESOBGA). They offer their support and financial assistance willingly when requested to do so and their contribution to the English School is invaluable. Graduates of the English School have made an outstanding contribution to all walks of Cypriot society - these include the sciences, medicine, education, politics, the arts, the business world, Government service, and the clergy. Many English School graduates have also made successful careers abroad. On looking back, all the graduates of the School agree that a unique bond is created between members of the English School family which is never broken. Our Founder, Canon Frank Darvall Newham, while founding this premier School in 1900, also introduced football, hockey and cricket to Cyprus. The English School's 'firsts' are many and varied. 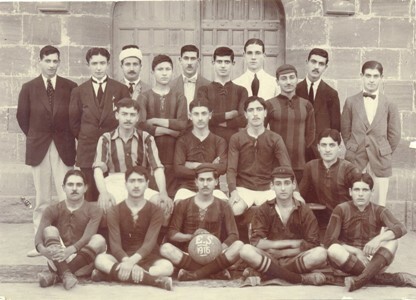 The first football match ever played in Cyprus took place at the English School in 1900, and the F.A. 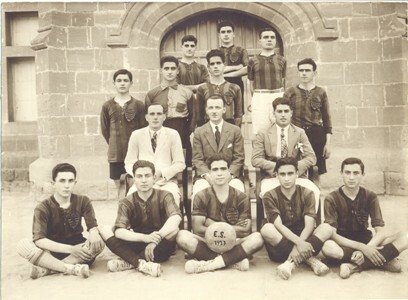 Football Challenge Cup was introduced through Canon Newham to Cyprus in 1912 after he observed the spreading interest in football throughout the island. Another 'first' for our School is the fact that the first ever appendix operation to take place in Cyprus was on an English School teacher in 1906, Mr. Douglas Hamilton, who survived! In 1952 the School's science laboratories became the first in Cyprus to be recognized by Universities for exams up to B.Sc. (Intermediate) standard. 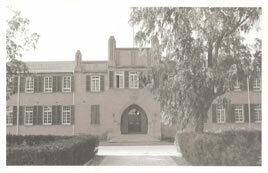 In 1962 the English School was the first school in Cyprus to become co-educational. When Canon Newham passed away on 6th March 1946 a local newspaper, Phoni tis Kyprou, wrote . "The late Canon Newham won the love and respect of all the people of Cyprus to a degree that could not ever be approached by any other Englishman who has visited and lived in Cyprus during the British occupation. The English School is a milestone in the Island's history of education and speaks volumes for the good work of its Founder." There can be no doubt that The English School stands apart, and belonging to the English School family not only provides one with the resources and skills to reach one's full potential, but creates friendships and memories which last for a life-time.